This scurrying vermin from Oblivion would be lost in the vastness of Nirn without a loyal companion and guide. Even a Daedric rodent needs a friend. 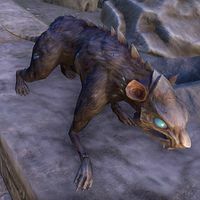 Daedrats are Daedric rat creatures that are available from the Crown Store for 500 . It was released alongside the Imperial City DLC. Its default name is "Twitchy". A foul-smelling Daedric minion, who will follow you loyally, though it won't fight for you. 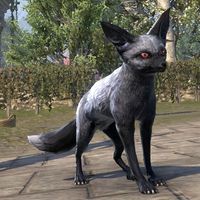 Scamp pets are available from the Crown Store for 700 , and in the Storm Atronach Crown Crates as a Superior-level reward. Its default name is "Stinker". Is this just a dark fowl, mere poultry of sinister visage—or does it hail from realms beyond Nirn, mayhap from the Deadlands of Mehrunes Dagon or the Ashpit of Malacath? Dare you ask yourself the dread question: Which came first? The Daemon Chicken is available from the Xanmeer Crown Crates as an Epic-level reward. 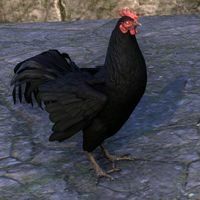 The Daemon Chicken is unique in that it is the only known noncombat pet whose name has an exclamation point in it. Its default name is "Horror Hen!". The hissing and twitching farmer who sells these claims they're just ordinary black roosters. And probably they are. You must have just imagined that this Cockerel's eyes glow after dark. You must have! image needed The Daemon Cockerel is available from the Hollowjack Crown Crates as a Legendary-level reward. Its default name is "Spurs". The Khajiit of Corinthe believe the all-black Dark Moons Lynx is the worldly incarnation of Southpaw, the feline companion to Rahjin the Footpad, god of thieves. It's said Southpaw keeps watch while Rajhin is breaking and entering. The Dark Moons Lynx is a pet available in the Wild Hunt Crown Crates as a Legendary-level reward. Its default name is "Southpaw". It may look cute, but this volcanic little pest comes from Mehrunes Dagon's Oblivion plane of the Deadlands: it's got lava in its blood and fire in its eyes, so keep it away from the curtains. 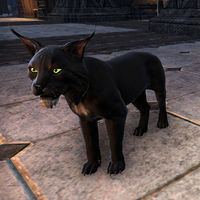 The Deadlands Bantam Guar is an upcoming pet. Its default name is "Pumice". The Deep-Moss Ash Hopper is native to southern Vvardenfell, where it's most commonly found in the fungal-forested uplands and the coastal marshes. They've been adopted as mascot bugs by the Buoyant Armigers, who admire their green carapaces. 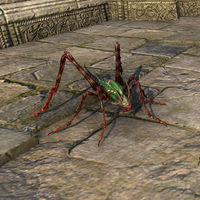 The Deep-Moss Ash Hopper was available in the Dwarven Crown Crates as a Legendary-level reward. Its default name is "Wub Bug". 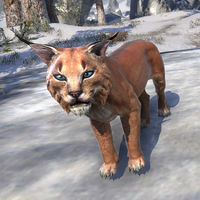 The Desert Lynx, or caracal lynx, is native to south central Tamriel, roaming the savannahs from Corinthe in [[Lore:Elsweyr|Elsweyr] as far north as the West Weald in Cyrodiil. It's the totem animal of the pastoral Khajiiti tribes, and assists with managing the herds. Desert Lynx pets are available from the Crown Store for 700 . Its default name is "Tufts". The Wood Elves say that to be followed by a friendly Torchbug is an infallible sign of good fortune. Of course, they also catch them, dry them out, and smoke them in pipes. 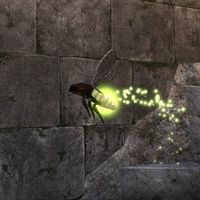 Devoted Torchbug pets were made available on PC/Mac via various promotions. It was first made available via promotional codes distributed to specific Twitch streamers, to be given away to viewers. Codes were later given out at the QuakeCon convention in 2018, and continue to occasionally be offered through social media giveaways. The pet is very small, as it is the same size as regular torchbugs encountered in the world. Its default name is "Flitterflash". When you always wanted a pony as a child and your parents wouldn't let you have one so you grew up bitter and tormented and became a dark cultist but now you can finally afford a pony. 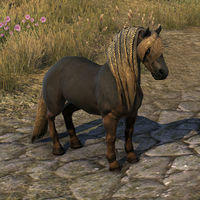 Dire Ponies were available from the Crown Store for a limited time for 1,200 . Its default name is "Frighthoof". 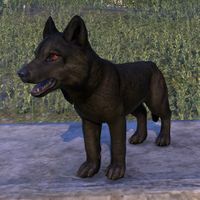 When a Doom Wolf Pup looks at you with its big red eyes, you may just melt inside - but as soon as you turn your back, that little rascal will be shredding your embroidered Arenthian pillows and digging up your herbal garden. The Doom Wolf Pup is a pet available in the Wild Hunt Crown Crates as a Legendary-level reward. Its default name is "Vandal". 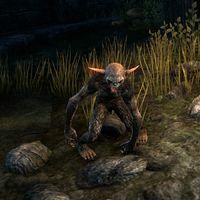 This creature, unusually cute for a denizen of Vvardenfell, is a newcomer to the island whose home and origin are unknown—unless the rumors are true that it's a hybrid born from the magical laboratories of the Telvanni. 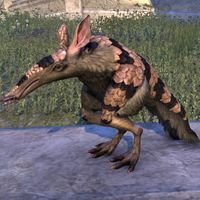 The Dozen-Banded Vvardvark pet was given out to owners of the Morrowind Chapter who logged in during the Morrowind Last Chance Event. Its default name is "Serjo Licky". The brown Goats of the Dragontail Mountains are stronger than they look. There's a saying in Hammerfell: "Hits as hard as a Dragontail ram!" 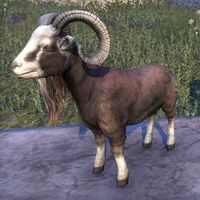 Available from the Crown Store for 400 . Its default name is "William". Combine Adorable with Abominable, and what do you get? 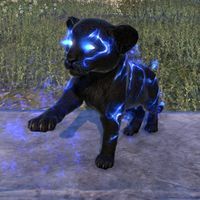 The dro-m'Athra Senche Cub, the cutest thing ever to come out of the Dark Behind the World. Dance, kitten, dance! The Dro-m'Athra Senche Cub is available in the Dwarven Crown Crates as a Legendary-level reward. It may try to catch a butterfly or belch blue flames while idle. Its default name is "Woe Kitty". The Dusky or Midnight Fennec Fox is native to the high savannah of northern Elsweyr, and is often domesticated by nomadic tribes of Khajiit. The Dusky Fennec Fox is a pet available in June 2018's Daily Rewards. Its default name is "Black-Ears". 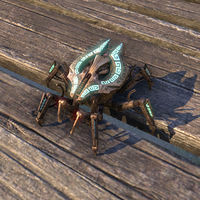 The Dwarven Spider Pet, not to be confused with Razak's Opus, is exclusively available through the Collector's Edition of The Elder Scrolls Online: Morrowind. Its default name is "Arachnimunculus". This construct was a sort of automated measuring device designed to explore and survey subterranean areas, according to scholars of the lost Deep Elves - except for Narsis Dren, who insists it was an object of pursuit in Dwemeri team sports. The Dwarven Theodolite can be acquired by finding and reassembling its seven parts in the ruin Nchuleftingth. Its default name is "Busybody". 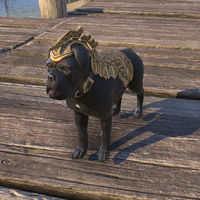 The Dwarven War Dog is exclusively available through the Discovery Pack promotional bonus included with The Elder Scrolls Online: Morrowind. Its default name is "Bthunch".